Equatorial counterelectrojet (CEJ) events are analyzed in association with changes in the interplanetary magnetic field (IMF), polar cap potential (PCP), and electric field measured in the equatorial ionosphere. In one event on 16 July 1995, the equatorial CEJ was observed at the afternoon dip equator during the recovery phase of the substorm when the IMF turned northward. Rapid decreases in the PCP and in the auroral electrojet occurred simultaneously with the equatorial CEJ, suggesting instantaneous equatorward penetration of the rapid decrease in the electric field associated with the region 1 field-aligned currents (R1 FACs) under the condition of a well-developed shielding electric field due to the R2 FACs. In the other event on 8 April 1993, the equatorial CEJ associated with the northward turning of the IMF was directly related to a rapid decrease in the equatorial electric field measured by the Jicamarca incoherent scatter radar as well as to a decrease in the PCP. We confirm the scenario for the substorm-associated equatorial CEJ as caused by the dominant R2 FACs when the R1 FACs decrease abruptly because of the northward turning of the IMF. We also suggest that the DP 1 current system is composed of the Hall currents surrounding the R2 FACs and the equatorial CEJ closing with the R2 FACs, which are superposed on the DP 2 currents caused by the R1 FACs, being dominant when the IMF turns northward. 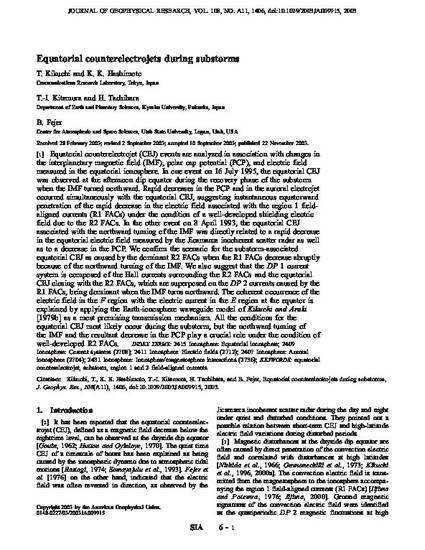 The coherent occurrence of the electric field in the F region with the electric current in the E region at the equator is explained by applying the Earth-ionosphere waveguide model of Kikuchi and Araki [1979b] as a most promising transmission mechanism. All the conditions for the equatorial CEJ most likely occur during the substorm, but the northward turning of the IMF and the resultant decrease in the PCP play a crucial role under the condition of well-developed R2 FACs. Kikuchi, T., K. Hashimoto, T.-I. Kitamura, H. Tachihara, and B. Fejer, Equatorial counterelectrojets during substorms, J. Geophys. Res., 108 (A11), 1406, doi: 10.1029/JA009915, 2003.